Well, you are at the right place then because we have listed down some of the best ways for you to buy/sell monero cryptocurrency. For the uninitiated, Monero is an open source and private cryptocurrency for anonymous transactions. It was also the pioneer cryptocurrency to advocate transactional privacy which Bitcoin lacks. Monero is so private that the enforcement department couldn’t even find the number of Monero coins Alphabay had when it shut down. That’s why people who like to transact on deep web or want transactional privacy have adopted Monero cryptocurrency very openly. And why not also when blockchain and cryptography have made it possible for the users to hide their transactional data. This USP of Monero encourages Monero investing for the people who want to enjoy privacy, security, and anonymity. So let’s look at the options from where and how you can buy Monero cryptocurrency but before that let’s look into Monero’s price action of the last few months. Monero’s price if you see from November 2016 has increased steadily from $5 to $50 mark as of today. And during the great crypto rush of 2017, Monero reached its all-time high of $370. Moreover, it has stayed in top #20 coins from the last 2 years on the CoinMarkteCap’s list, which is of course not an easy thing to do when every day new cryptocurrencies are being launched. How To Buy Monero (XMR) Cryptocurrency? Now, let’s look at all the avenues through which you can buy Monero coin because that’s the first thin any Monero trader or Monero investor would like to know. Now that you know all the options through which you can buy Monero, let’s see all the avenues where you can buy XMR coin. Where To Buy/Sell Monero (XMR) Coin? Purchasing Monero through a credit card directly isn’t possible as of now but you can surely buy Bitcoin or Ethereum from CEX through a credit/debit card. And once you have got your BTC or ETH, you can send that to Binance to exchange it for Monero. If you don’t want to do this and engage directly with fiat, check out our next suggesting option. You can easily buy Monero for fiat currencies because Monero has been here for some time and that’s why there are reliable services in the market offering Monero for Fiat. You can also buy Monero from Kraken if you have access to EUR and USD both as this exchange supports both the fiat currencies but for verification, you might need to wait for long hours. So here on these Monero exchanges, you can very well deposit your fiat currencies once you have completed your registrations on these exchanges and start buying/selling Monero coin. If you already have Bitcoin or Ethereum and want to exchange it for Monero without going through long verifications or a proper order book exchange, then you should try CoinSwitch. Yes, CoinSwitch because Changelly has recently stopped supporting Monero and in that case, CoinSwitch is a good alternative for it. First, get your Monero address ready where you would like to receive your Monero. Second, you should have some bitcoins/altcoins to exchange for Monero. Now, head on to CoinSwitch and select one of their recommended ways to exchange XMR for BTC and you should be good. Another easy way to get hold of your Monero coin is through centralized crypto-to crypto exchanges. If you have BTC/ETH/LTC or USDT and want to exchange it for Monero, it is easy. You can simply head towards crypto-to-crypto Monero exchanges and can simply swap your cryptocurrencies for XMR by picking the best offer from the order books. When you want to Buy Monero peer to peer, the first thing that comes to mind is, cryptocurrency ATMs. And the good news is, there are quite a few cryptocurrency ATMs through which you can buy Monero for cash. 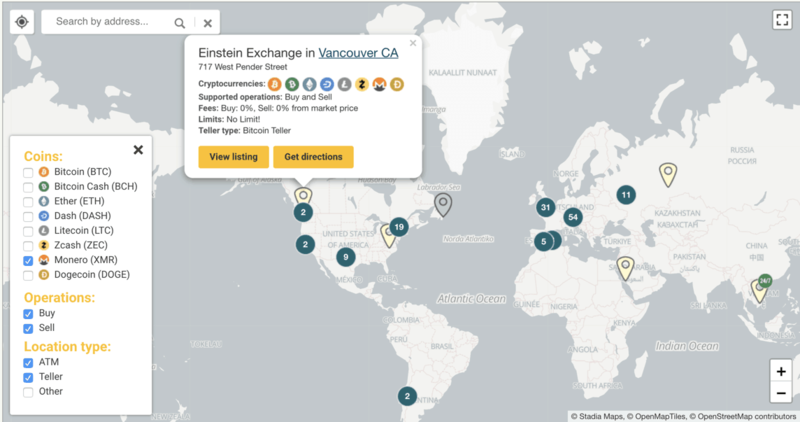 Coin ATM Radar: CoinATMRadar keeps track of cryptocurrency exchanges all-around the world and when you check-out for Monero ATMs you will find quite a few across the globe. So check out CoinATMRadar to see if there is any crypto ATM supporting Monero in your vicinity. LocalMonero: LocalMonero is a Monero only service inspired by LocalBitcoins. At LocalMonero you can buy or sell Monero with popular online payment methods (such as bank transfer, PayPal, credit card etc.) or with cash via local meetup. Note: This is an escrowed service so you need not worry about anyone running away with your funds if you follow the process correctly. 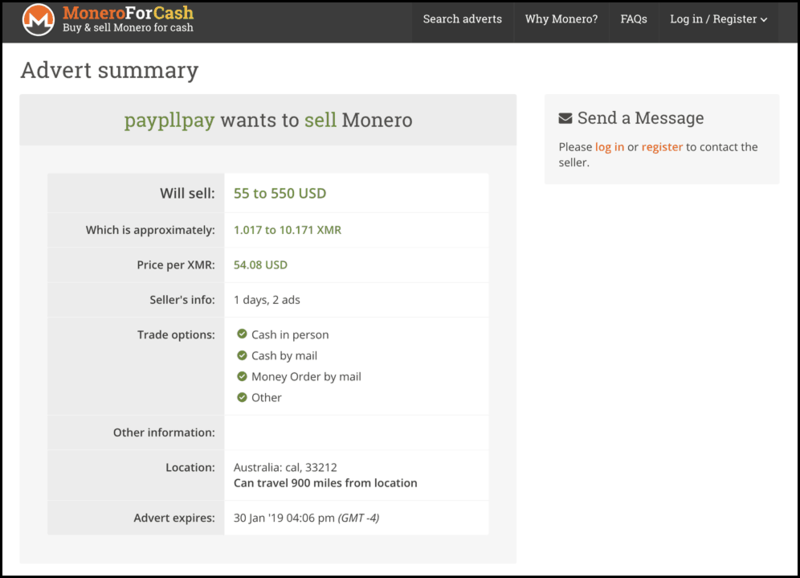 MoneroForCash: This is another service to exchange your Monero for cash. 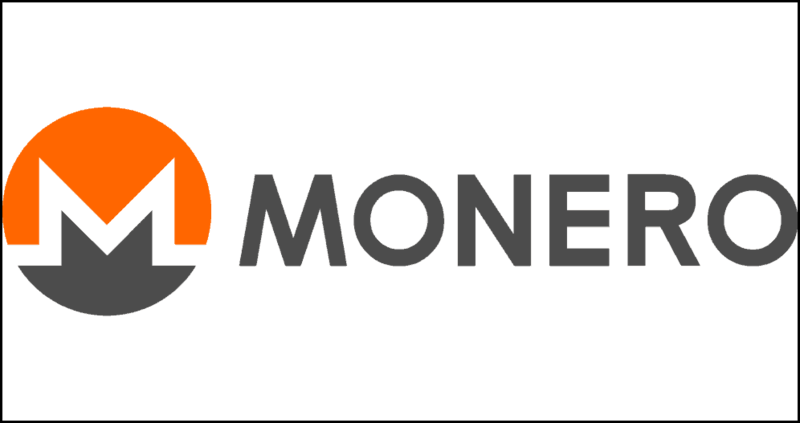 Apart from that buyers/seller can advertise on the MoneroForCash platform and decide to meet in person or set the trade rules. But beware, this is not an escrowed service so you need to be very smart while dealing with buyers/sellers of this platform. 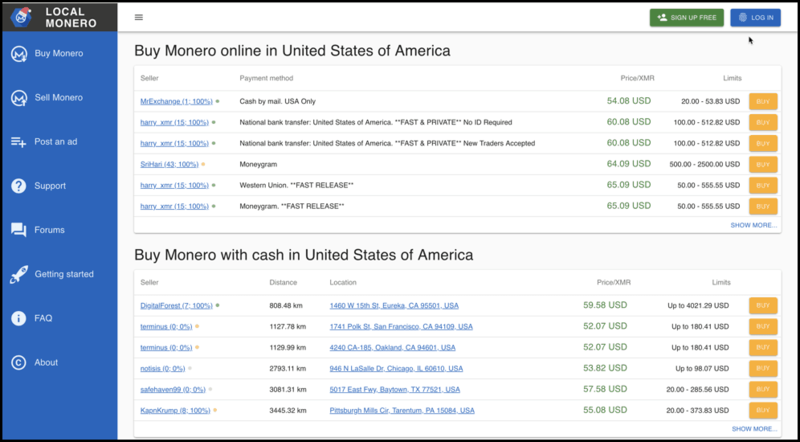 I wouldn’t recommend buying Monero from PayPal or Skrill directly or indirectly because they are a huge upfront fee for their service and it can be as high as 10-12% which should not be the case with cryptocurrencies. So these are some of the popular ways through which you can buy Monero cryptocurrency but I know some of you want to buy Monero anonymously. What good is an anonymous cryptocurrency if we need to buy it from centralized service by disclosing our identity. Buy Monero from ATMs: ATMs don’t keep your identity, so this is one of the ways to buy Monero anonymously. Buy Monero from LocalMonero: You can use your alias email ID and buy Monero from LocalMonero online or offline by keeping your name and other details as a proxy. Buy Monero from CoinSwitch: If you have BTC or ETh exchange it for XMR using CoinSwitch service because it doesn’t require you to register or disclose your email ID also. Conclusion: What Is The Best Way Of Monero Trading & Investing? How Should You (I) Buy Monero? Well, I would vouch for option #2, #3 and #4 as I have described above but in any case, we don’t recommend you to use these services for storing your Monero. Because these services are only good for purchasing Monero coin and being centralized services these services are prone to attacks. That’s why we would recommend you to look at this list of best monero wallets and choose one secure Monero wallet for yourself. Now you tell us: How you are going to buy your Monero cryptocurrency? Which Monero wallet do you plan to use? Tell us in the comments below.